Many patients with coccyx pain (tailbone pain, coccydynia) get excellent relief and improved quality of life via various types of coccyx injections. Prior to injections, it is important that the patient undergo a thoughtful, careful evaluation regarding the actual source of their pain. Often, the injections can be repeated either to provide more thorough/complete relief or if someone gets excellent relief but the pain is coming back many months or even years later. Regarding the specifics of exactly how often to repeat injections, this varies from patient to patient. When I was in medical school back 25 years ago, doctors typically said that you could repeat a steroid injection at a given joint/site up to 3 times per year, and more recently many doctors will say that you could repeat a steroid injection up to 3 times within a six-month window. I tend to be skeptical of repeating the injections quite that often, because if I had to do the same injection for someone 3 times every 6 months (meaning 6 times per year) that in my opinion the injection is not very helpful. Sometimes an injection gives complete and sustained relief and the pain never comes back at all. Very commonly we see patients who get excellent relief for several months or for a year or 2, or even for 3 years (or even longer depending on the type of injection). So, some patients do very well with coming back for a repeat injection every year or 2, or once or twice a year. This varies from patient to patient. If doing a repeat injection provides excellent quality of life and avoids the need for addictive opioid/narcotic painkillers or avoids the need for invasive coccygectomy surgery (and thus avoids the risks of surgical side-effects such as post-operative infection and other surgical complications), then those injections can be repeated on that kind of an infrequent frequency on an ongoing basis. In the small percentage of patients who may have difficulty tolerating the injections for whatever reason (e.g., in some diabetic patients the steroid component of the injection can make the blood sugars go higher) then that may limit how often the injections are repeated. 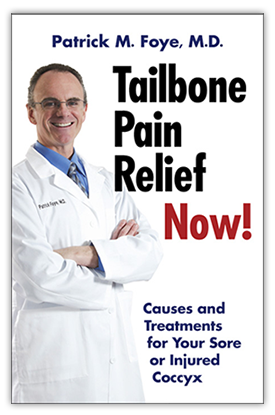 There is no treatment for coccydynia (coccyx pain) that is guaranteed to provide 100% relief for 100% of patients. Every treatment has its pluses and minus (risks and benefits), which patients should discuss with their in-person physician. Meanwhile, overall, for those who do not get enough relief from cushions and such, various coccyx injections can often be an extremely helpful cornerstone of the overall treatment plan.